A “Class of 1970” inductee, Andrew “Andy” Branigan played his first NHL pro game in 1940 at the age of 18. A year later, he left the team in mid season to serve his country in WWII. He never played another NHL game. He was a member of the Reds 1955-56 Calder Cup champions. He is 15th all-time in games played in AHL history with a grand total of 859. He had earlier won a Calder Cup with Hersey in 1946. 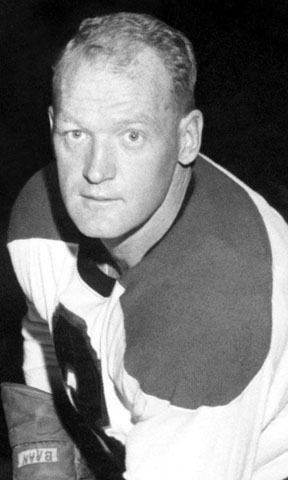 In 238 games with Providence from 1954 to 1958, the popular and bruising redhead, notched 56 points on 11 goals, 45 assists and 324 PIM. Branigan played in two NHL seasons from 1940 to 1942 and tallied three points in 27 games. Andy became a player/coach in the Eastern Hockey League at the end of his career. He was inducted into the Manitoba Hockey Hall of Fame in 1992.